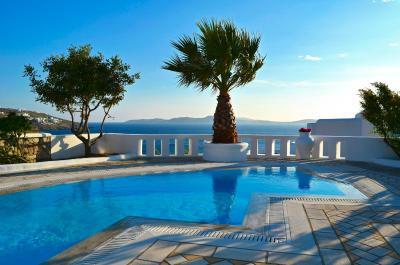 Lock in a great price for Saint John Hotel Villas & Spa – rated 8.7 by recent guests! Gorgeous property, friendly staff, clean and comfortable. View was amazing. Location was great. Helpful and efficient staff. 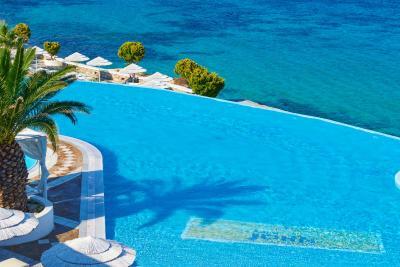 The pool area was fantastic and the staff were especially nice and extremely helpful! Thank you to all for making us feel comfortable and for the transfer service i'm particular !!! The breakfast was amazing! I could find everything I wanted, even learned to prepare Greek coffee on the sand by myself (only did not find any porridge, maybe nobody asks for it):) The beds were also extremely comfortable! Also lots of cats around, which made the hotel feel so much more cosy as most of them are very friendly - one of them was a returning guest on our balcony as he came to visit us almost every day! 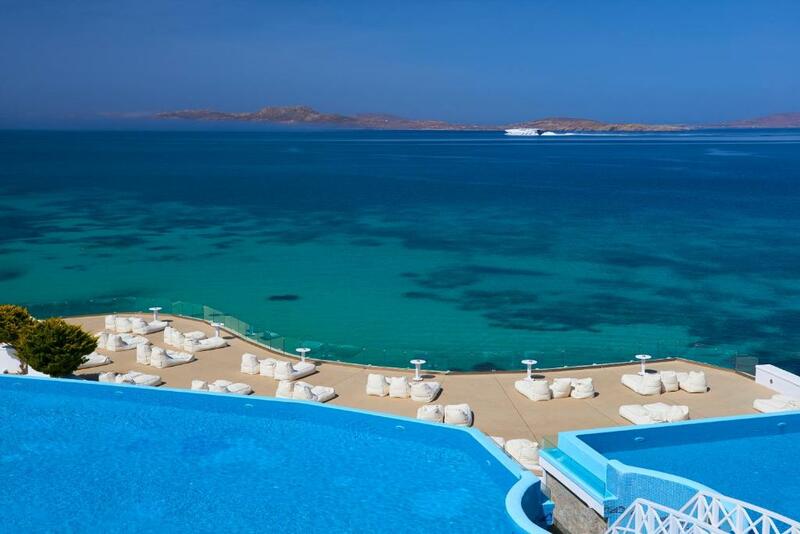 Fantastic view of the sea and Delos island from a Sea View room! 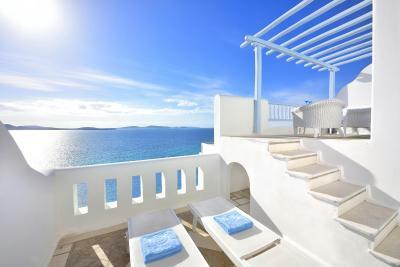 Generally the location of the hotel and the transport services it offers is absolutely wonderful, the latter being a huge necessity in Mykonos as there is no availability of public transport on the island. Great valet service. Beds were comfortable. Great views. Its close to downtown, the room was a good size and the staff were friendly. The most amazing sunset. 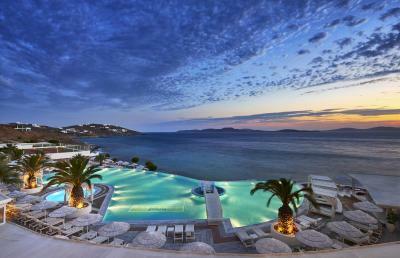 Overall the hotel is great, but like many Greek hotels, the 5 star hotel is not much different than the level below. Everything was just great. Staff, food, rooms, ambiance, breakfast, pool and etc. Saint John Hotel Villas & Spa This rating is a reflection of how the property compares to the industry standard when it comes to price, facilities and services available. It's based on a self-evaluation by the property. Use this rating to help choose your stay! 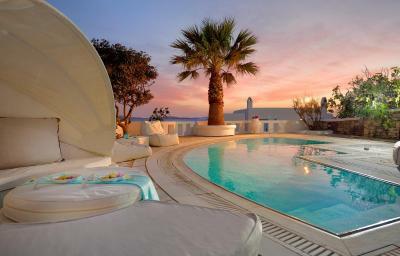 One of our top picks in Agios Ioannis Mykonos.Occupying 5 acres, Saint John Hotel Villas & Spa features an infinity pool with open views of its private beach. 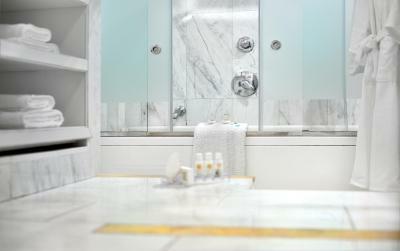 Rooms with spa bathtub, fine dining, and famous bars await guests. 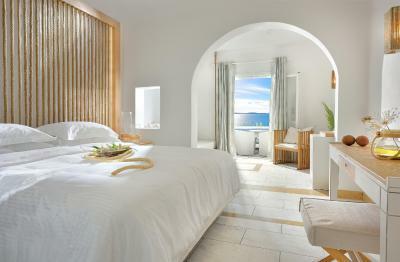 The elegant rooms offer sea or garden views. They come with many comforts, such as free Wi-Fi, cable and satellite TV, CD/DVD player, and tea and coffee maker. A piano bar, 3 gourmet restaurants and 2 other bars offer guests different dining and drinking opportunities from casual to romantic. 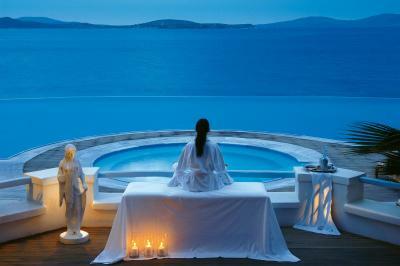 The Aphrodite Spa & Beauty Center provides 5 treatment rooms. 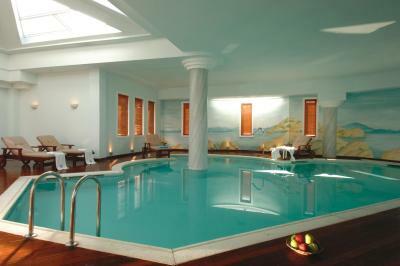 The state-of-the-art facilities include saunas, hammam and indoor heated pools. 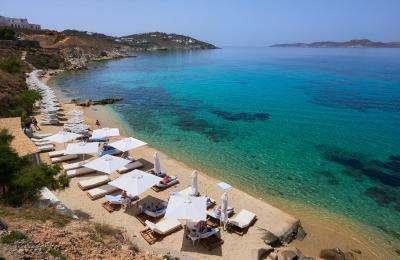 Mykonos Airport is 2.5 miles away, and the new Mykonos Port is 4 miles away. 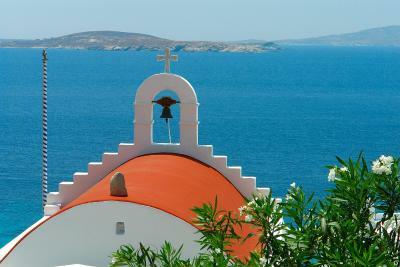 The bustling Mykonos Town (Chora) is 2.5 miles away. Free private parking is available. 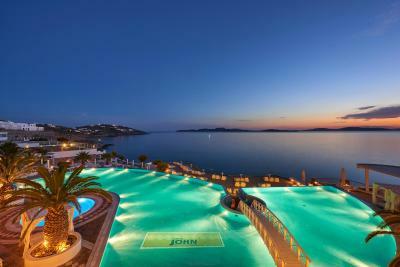 When would you like to stay at Saint John Hotel Villas & Spa? 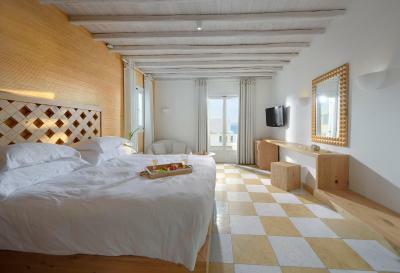 These garden-view rooms are next to the verdant gardens of the Saint John Hotel Resort. 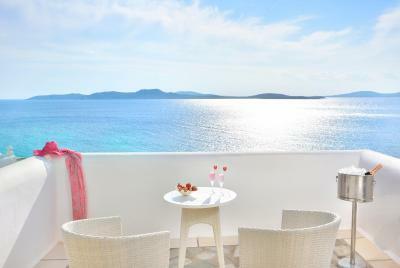 Offering breathtaking sea views of the Aegean Sea, the sea-view rooms offer beautiful décor with references to Grand Island life, and handpicked furnishings. 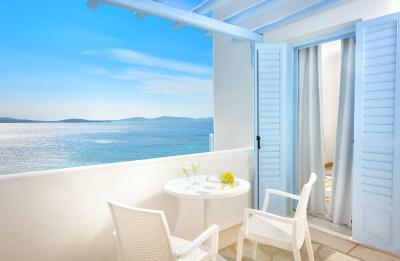 Located above the resort’s private beach, the waterfront rooms have private porches overlooking the sunset over Delos Island and the Aegean Sea. 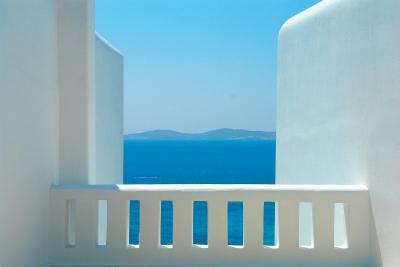 Suites feature elegant interiors and open out to the Aegean. They offer a bathroom with spa bathtub or steam shower and a living room. 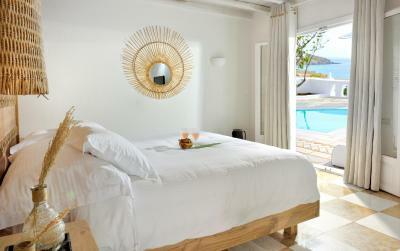 One-Bedroom Villa with private pool, living room, two bathrooms with spa bath and steam shower and mini bar. 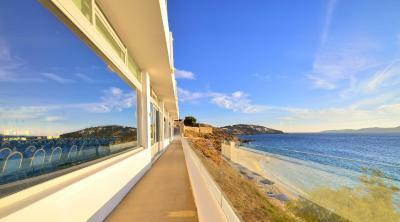 The villa is 80m2 with a 130m2 veranda. 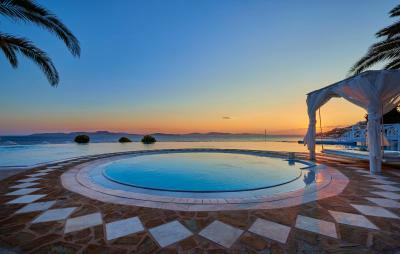 It offers a view of the private beach and island of Dilos. Please note that it is located 492 feet from the main building. 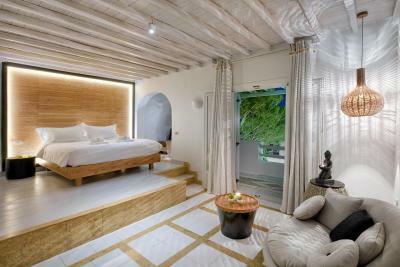 This villa features a mini-bar, private pool and spa bath. 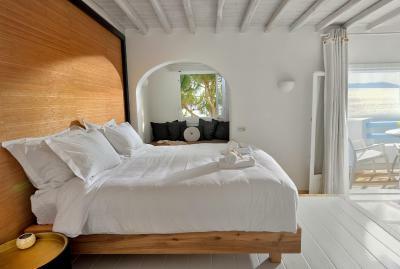 This villa features a mini-bar, bathrobe and spa bath. 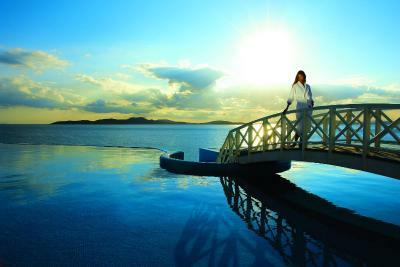 Welcome to Saint John Hotel Villas & Spa, a luxury oasis in one of the most cosmopolitan destinations in the world. 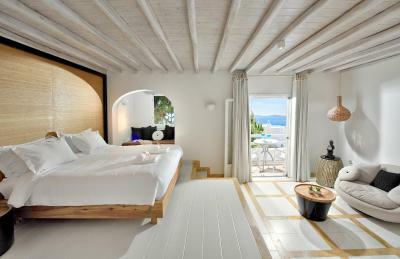 Discover the beauty of Mykonos from the most prestigious resort, wonderfully surrounded by Agios Ioannis, a private beach of silky sand and crystalline waters. High class hospitality, unique culinary wonders, magical views to the Aegean and 5 star services compose the absolute holiday experience. In Saint John, you will find a haven of serenity with superb Spa facilities, a great place for your fairytale wedding and honeymoon, as well as the top combination of easy accessibility to sights & attractions, vibrant Mykonian nightlife and unsurpassed tranquility! 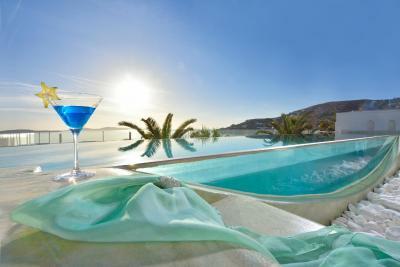 House Rules Saint John Hotel Villas & Spa takes special requests – add in the next step! Saint John Hotel Villas &amp; Spa accepts these cards and reserves the right to temporarily hold an amount prior to arrival. Saint John Hotel Villas & Spa accepts these cards and reserves the right to temporarily hold an amount prior to arrival. Please note that the guests who book the halfboard rate are offered breakfast and dinner, as well as discounted rates at the spa. Should you wish to make use of the free transfer, kindly get in touch with the property 48 hours in advance. 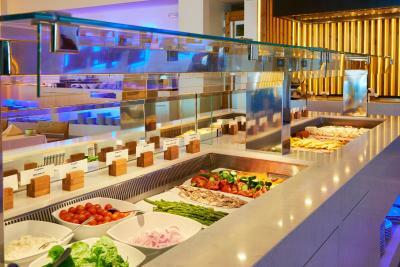 Great hotel and superb food and service and facilities. GOOD Bus/ shuttle driver was TOO nice. He was the only one that was good Food at the restaurant was good. So was the yummy breakfasts. 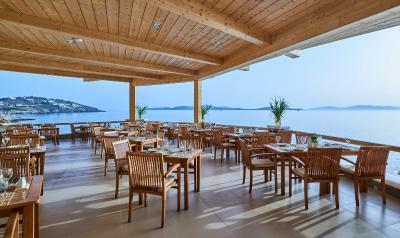 Its about 15 mins away from Mykonos town.. so have to find a way to get to the town.. taxis dont seem reasonable with EUR 15 one way.. ATV or bike is probably the best way to get around..
Amazing breakfast spread.. Beautiful view.. Mykonos is a stunning island..! There was loud banging above us. High step in and out of the shower. The gym smelt bad. The pool and the view was amazing. The service was great. 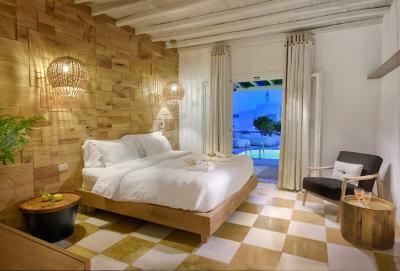 The rooms were clean and very nice. You have access to a tiny sand beach. The location is great in relation to ornos. Short ride to the town. The room next door had very noisy children that kept us awake crying through the night and during the early morning they were slamming the door over and over and dragging chairs around the room. It was loud and disturbing to our peace and much needed sleep. On our second last morning we were woken very early with a truck below our room gathering glass bottles. They were throwing boxes of these bottles into the truck causing loud breaking glass noises for over 20 minutes. The room below us had a smoker who was on the verandah smoking regularly which wafted up into our room through our open doors making our sea air not so fresh. On our last day the cleaners only left us one towel. The view and pool facilities were wonderful. The sunshine aspect was perfect and rooms very comfortable. 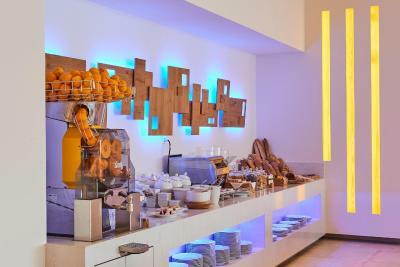 The buffet breakfast was the best I’ve ever experienced and the coffee on point. Courteousy bus was convenient for trips into Mykonos and back. Staff were helpful and kind. maybe the room need some renovations. I asked to rent a car and they give me for a price very high ( but ok for the service in the hotel) a rely ugly car. I suggest to use professional companies for this service in the future and not friends and parents. beautiful hotel with top view, the workers are very nice. 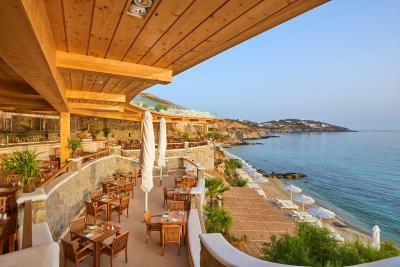 the restaurant serve delicious food and also the breakfast is very at the top. The room we had was very noisy. We could hear the people next door showering and talking. There were no handrails to assist walking up and down the steps (and there are a lot) At meal times in the evening the staff were overbearing. The gym needs updating and there should be water available. The spa treatment I had was very poor. The bed was very comfortable. The breakfasts were excellent. The pool areas were very good. I LOVED everything about this place. 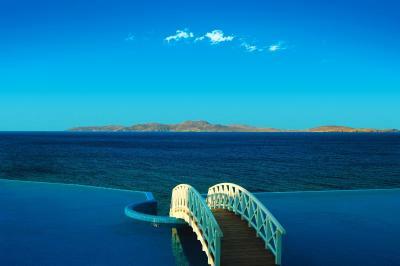 The infinity pool is breathtaking. The staff are very very nice. I didn't experience the tennis court but this place has many amenities! 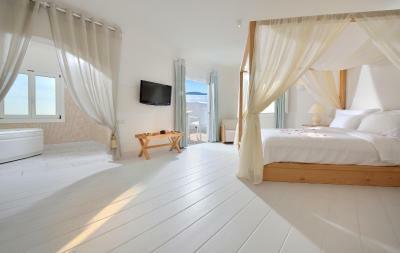 The room was immaculate with everything you would need and the bed was huge and so comfortable! The sea view was stunning! Food and drinks were very expensive. Food was subpar for Greece standards.